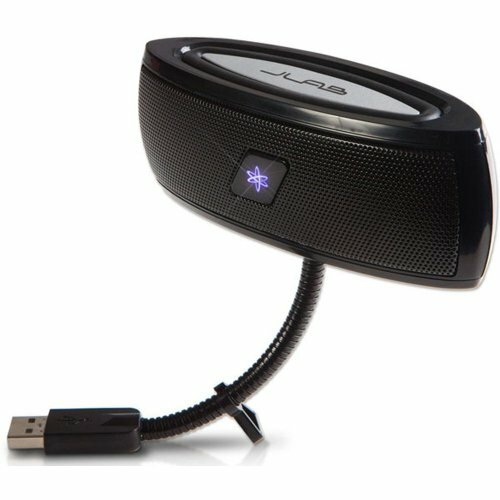 If you are looking for a simple and inexpensive accessory for your computer that will allow you to easily broadcast sound from your laptop, you will want to check out the JLab USB Laptop Speakers that work with both PC's and Mac computers. This portable, compact travel notebook speaker produces Hi-Fi Stereo sound and attaches to your computer through the USB port. It is produced in a variety of colors to match your computer, including black, cotton candy pink, pearl white, red hot and titanium silver. JLab Audio is a company that specializes in producing high quality and portable audio products. Their products are available in stores that sell similar electronic devices, as well as from Amazon. If you have any problems, they provide an email address you can use to contact them directly. They try to respond within 24 hours. They also have a 24 hour toll free phone number. Of the 276 customer reviews on Amazon, this product was given an average of four stars out of a possible five stars. In fact, 136 purchasers rated it a full five stars. It retails for around $70, although as of this writing they are on sale through Amazon at a significant discount. See the ad at the bottom of this article for their current price. If you purchase these speakers as a gift and order them from Amazon, you can have them gift wrapped, or simply ask to have a gift message included. Gift messages are free, but there is a charge for gift wrapping. Here are some phrases from the customer reviews on Amazon. I have included both comments that have given the JLab speakers high praise, as well as a few specific negative comments, so that you can judge for yourself if this handy little speaker system will work for you. "Great sound from a little package." "Not recommended for Dell Laptops. After several weeks, the speaker stopped working." "Small, easily transportable, decent sounding speakers." "They take up approximately the same amount of suitcase space as a computer mouse." "I own a 2007 MacBook ... and I cannot believe I lived for so long before without (this speaker)"
"Terrific Little Speaker with Clear, Strong Sound"
"I read the lukewarm and negative reviews...but ordered one, anyway. This is one cool device ... Get real ... Sure the sound is not studio quality. However, it greatly surpasses computer built-in speakers." These reviews should help potential buyers have realistic expectations about the sound quality and the convenience of this handy accessory, which makes listening to music on your laptop much more enjoyable. Although the JLab USB Laptop Speakers may not be the perfect sound solution for everyone all the time, from the customer reviews I read they appear to be small, portable and capable of producing reasonably high quality sound for anyone who wants to amplify the sound from their laptop. They are also easy to travel with, since they take up very little space in your carry-on bag. They also make great gifts for anyone you know who enjoys watching movies or listening to music on their laptop. You can learn more about them by checking out the ad at the end of this article. These speakers are perfect for someone looking for high quality sound from their laptop. Speakers for a laptop, what will they think of next? Great information Deb! Thanks, Introspective. I think this will be a popular gift for Christmas this year!